Sprinkler irrigation of cotton crops in Israel's Hula Valley. Irrigated agriculture has been an extremely important source of food production over recent decades. As the graph below shows, the highest yields that can be obtained from irrigation are more than double the highest yields that can be obtained from rainfed agriculture. 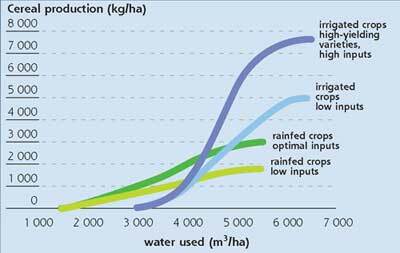 Even low-input irrigation is more productive than high-input rainfed agriculture. Such are the advantages of being able to control, quite precisely, water uptake by plant roots. Even so, irrigated agriculture contributes less food than rainfed agriculture. Globally, rainfed agriculture is practised on 83 percent of cultivated land, and supplies more than 60 percent of the world's food. In water-scarce tropical regions such as the Sahelian countries, rainfed agriculture is practised on more than 95 percent of cropland. One reason is that, in these areas, conventional irrigation development of food crops may be extremely costly and hardly justified in economic terms. There are other reasons why conventional irrigation cannot continue to grow as fast it has over the past few decades. For one thing, the real cost of irrigated food production is far from clear since, to quote one author, irrigation is `one of the most subsidized activities in the world'. The environmental costs of conventional irrigation schemes are also high (and are not reflected in food prices) - high-intensity irrigation leads often to waterlogging and/or salinization. About 30 percent of irrigated land is now severely or moderately affected. The salinization of irrigated areas is reducing the existing area under irrigation by 1-2 percent a year. In spite of these reservations, of course, not only will irrigation continue to be used but the area under irrigation will also expand. What is also badly needed is improved efficiency in the use of irrigation water (see box on opposite page). Irrigation has the potential to provide higher yields than rainfed agriculture but water requirements are also much higher. sub-irrigation, in which the groundwater level is raised sufficiently to dampen the root zone. The first two of these, surface and sprinkler irrigation, are together known as conventional irrigation. 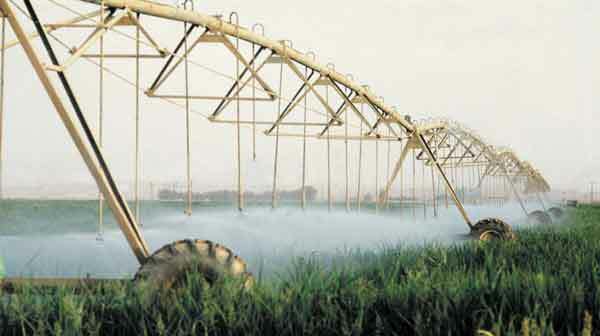 Surface irrigation is currently by far the most common technique, and is used particularly by small farmers since it does not involve operation and maintenance of sophisticated hydraulic equipment. For the same reason, surface irrigation is still likely to be dominant in 2030, even though it is wasteful of water and is a major cause of waterlogging and salinization. Drip irrigation and underground irrigation are examples of localized irrigation, an increasingly popular form of irrigation in which water efficiency is maximized because water is applied only to the places where it is needed and little is wasted. However, technology is not all. Such things as small-scale irrigation and the use of urban wastewater promise to increase water productivity as much as changes in irrigation technology. Localized irrigation has grown rapidly since the invention of cheap plastic pipe in the 1970s. If incentives are in place - and increasing the price of irrigation water is likely to be a principle one - farmers will adopt water-saving irrigation technologies. The main technologies likely to be used in developing countries, where labour is normally abundant but capital scarce, are underground and drip irrigation. Both technologies depend on the frequent application of small amounts of water as directly as possible to the roots of crops. A major advantage of water-saving technologies, particularly drip irrigation, is that as well as saving water they can increase yields and reduce the rate of salinization. Furthermore, since neither system brings water into contact with foliage, they can be used with brackish water for crops that are not too sensitive to salinity. Some of the underground irrigation systems are simple techniques that do not require costly inputs in equipment but are labour intensive. Indeed, one of the oldest methods of irrigation is placing porous clay jars in the soil around fruit trees and along crop rows. The jars are filled by hand, as required. Porous or perforated pipes buried underground serve the same purpose, and can usually be used to irrigate two rows of crops, one on either side of the pipe. The rate of application cannot be controlled (although the frequency can) since it depends on the size of the perforations and soil characteristics. 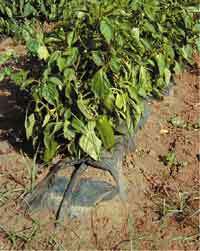 Drip irrigation has been applied only on a small part of the area for which it is suited. It depends on a pressurized system to force water through perforated pipes running above ground, at rates of 1-10 litres per hour per emitter. Though the technology is simple, it does require both investment and careful maintenance - emitters can easily become clogged. However, results from many countries show that farmers who switch from furrow (trench) systems or sprinkler irrigation to drip systems can cut their water use by 30 to 60 percent. Crop yields often increase at the same time because plants are effectively `spoon-fed' the optimal amount of water (and often fertilizer) when they need it. irrigate frequently with just the right amount of water to avoid crop distress. Drip systems, which cost in the range of US$1200-2500 per hectare, tend to be too expensive for most small-scale farmers and for use on low-value crops but research is under way to make them more affordable. One drip system has been developed that costs less than US$250 per hectare. The keys to keeping costs down are simple materials and portability: instead of each row of crops getting its own drip pipe, a single pipe moved every hour or so can be used to irrigate as many as ten rows. Bubbler irrigation is another cheap variation which eliminates the need for emitters, pressure regulators and other fittings; instead, water is allowed to bubble out of short lengths of pipe placed vertically and connected to underground lateral distributor pipes. There is considerable promise in a range of traditional and modern small-scale and supplementary irrigation systems to increase the productivity of rainfed areas. Technologies such as treadle pumps (see box opposite) can allow resource-poor farmers to manage their own systems to suit their needs, providing water is locally available. Pumping water with small-scale diesel or electric engines can also be more economic than large-scale schemes that rely heavily on centralized control. Furthermore, because individual farmers are in full control of their own systems, they can often maximize production to suit their own lifestyles - something impossible with large, centrally-controlled schemes. Drainage of irrigated land serves two purposes:to reduce waterlogging and, equally important, to control and reduce salinization that inevitably accompanies waterlogging in the semi-arid and arid regions. Proper drainage also allows crop diversification and intensification, the growth of high-yielding varieties, effective use of inputs such as fertilizers, and mechanization. The problem is restricted to about 100-110 million hectares of irrigated land located in semi-arid and arid zones. At present, about 20-30 million hectares of irrigated land are seriously damaged by the build-up of salts and 0.25-0.5 million hectares are estimated to be lost from production every year as a result of salt build-up. The currently drained area of 25-50 million hectares is insufficient. Therefore, drainage of irrigated land is badly needed. However, drainage has two important drawbacks. First, drainage effluent is often contaminated with salts, trace elements, sediments and traces of agricultural inputs. The drainage effluent needs to be safely disposed of. Second, improved drainage in upstream areas causes larger downstream flows, increasing the risk of floods. Therefore, new drainage projects should consider not only the benefits of sustainable agricultural production but the side effects on the environment. Some 100-150 million hectares of rainfed land, mostly in Europe and North America, have been drained while another 250-350 million hectares are in need of drainage. Much crop production takes place on what were once wetlands. However, this type of drainage development has come to a standstill as the value of natural wetlands has become better appreciated. In the early 1990s, an FAO project funded by the Netherlands sought to develop horticulture in Cape Verde. The project was a success but its extension was limited by the availability of water - average precipitation on the islands is about 230 mm/year, providing little more than 700 m3/person/year. Drip irrigation was then introduced, first in experimental plots and then in farmers' fields. The new system increased production and saved water, allowing for an expansion of the irrigated land and cropping intensity. Convinced by the experiment, many farmers spontaneously adopted drip irrigation on their land. In 1999, six years after the first experi-ment, 22 percent of the irrigated area of the country had been converted to drip irrigation, and many farmers had converted their crops from water-consuming sugar cane plantations to high-return horticultural crops such as potatoes, onions, peppers and tomatoes. 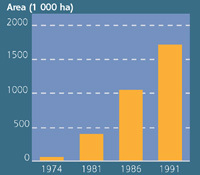 Total horticultural production increased from 5700 tonnes in 1991 to 17000 tonnes in 1999. 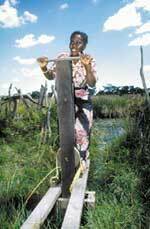 It is estimated that a plot of 0.2 hectares provides farmers with a monthly revenue of US$1000. Reducing the pollution loads of water used by farms, industries and urban areas would enable much more of it to be re-used in irrigation. There are enormous potential benefits to be had from the use of wastewater for irrigation. As an example, a city with a population of 500000 and a water consumption of 120 litres/day/person produces about 48 000 m3/day of wastewater (assuming 80 percent of the water used reaches the public sewerage system). If this treated wastewater were used in carefully-controlled irrigation at a rate of 5000 m3/ha/year, it could irrigate some 3 500 hectares. The fertilizer value of the effluent is almost as important as the water itself. Typical concentrations of nutrients in treated wastewater effluent from conventional sewage treatment are: nitrogen, 50 mg/litre; phosphorus, 10 mg/litre; and potassium, 30 mg/litre. At an application rate of 5000 m3/ha/year, the fertilizer contribution per year of the effluent would be: nitrogen, 250 kg/ha; phosphorus, 50 kg/ha; and potassium, 150 kg/ha. Thus all the nitrogen and much of the phosphorus and potassium normally required for agricultural crop production would be supplied by the effluent. In addition, other valuable micronutrients and organic matter contained in the effluent would provide additional benefits. An added benefit is that because most of these nutrients are absorbed by the crop they are removed from the water cycle and hence play no further role in the eutrophication of rivers and the creation of Dead Zones in coastal areas. Projections indicate that even with optimistic views about productivity growth, efficiency and the expansion of irrigated area, 14 percent more water will be needed for irrigated agriculture in the developing countries by 2030. This will require some 220 km3 of extra storage. In addition, storage that is lost due to the siltation of existing reservoirs must be replaced; this is estimated at 1 percent or 60 km3 a year - 1 800 km3 over 30 years. A further 160 km3 of water that is mined from aquifers should also be replaced. The total required over the next 30 years is thus in the region of an additional 2 180 km3 of storage, or more than 70 km3 a year (not allowing for increasing evaporation losses as a result of the increased area). The task is thus to put in place at least the equivalent of a new Aswan High Dam every year. For a variety of economic, environmental and social reasons, it is not likely that this amount of additional surface storage will be constructed in the next 30 years. In Zambia, FAO's Special Programme for Food Security (SPFS) has successfully promoted the introduction of small-scale irrigation technology. In drought-prone areas of the country, farmers traditionally used laborious bucket-carrying methods to irrigate their plots. During the SPFS pilot phase, treadle pumps were introduced which could pump water from a depth of eight metres with a discharge of 1.5 litres/second. Modifications were made to adapt the pumps to local conditions, and three types of pumps are now being locally produced by nine manufacturers. Farmers from all over Zambia have so far bought 1 500 pumps. Consequently, the supply of fresh vegetables both at household level and village level in Zambia has improved considerably. Storing more water in aquifers is an attractive alternative. New techniques and institutional mechanisms are urgently needed to stimulate the recharge of groundwater aquifers.